With the streams of thy tears thou didst irrigate the barren desert, and with sighs from the depths of thy soul thou didst render thy labors fruitful an hundredfold, and becamest a beacon for the whole world, resplendent with miracles. O Hilarion our father, entreat Christ God, that our souls be saved. 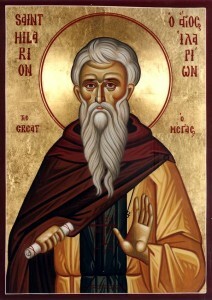 Assembling today, in hymns we praise thee as a never-waning luminary of the noetic Sun; for thou hast shone forth upon those in the darkness of ignorance, guiding all up to the divine heights, O Hilarion. 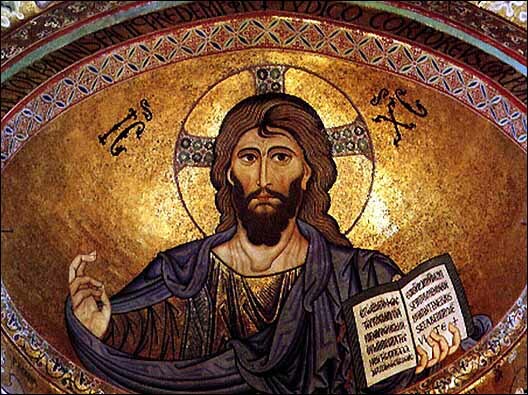 Wherefore, we cry out: Rejoice, O father, thou foundation of all fasters! Akathist to the Mother of God Nurturer of Children before Liturgy next Sunday. On October 24th and 25th we read Colossians 1:18-29. In these verses Saint Paul is speaking to Christians in Colossae, a city in Asia Minor, who are tempted to seek hidden, exclusive knowledge that others don’t have. At the time when this letter was written, false teachers were busily preaching and teaching in places where Paul had preached and taught the truth. Many of these false teachers were Gnostics, who advocated, and encouraged others to adhere to, ideas that were far from the teachings of the apostles. One of the most basic teachings of Gnosticism was that the only way to become a spiritual human being—the most desirable possible human achievement–was to gain secret knowledge not accessible to every person, but only certain ones. This idea was very threatening to the Church, because the Gnostics looked down on Christianity as a primitive faith, and prized secret rituals over the sacraments of the Christian Church. Opposing this idea, Paul writes that he became a minister “according to the divine office which was given to me for you, to make the word of God fully known, they mystery hidden for ages and generations but now made manifest to His saints.” In other words, God sent Paul as a divinely-appointed minister to His people so that Paul could reveal to them the “knowledge of God’s mystery, of Christ, in whom are hidden all the treasures of wisdom and knowledge” (2: 2-3). Christians have no reason to seek hidden, exclusive knowledge. The great mysteries are all in God and Jesus Christ, the creators of all things, and our loving God and His Son reveal them to us.